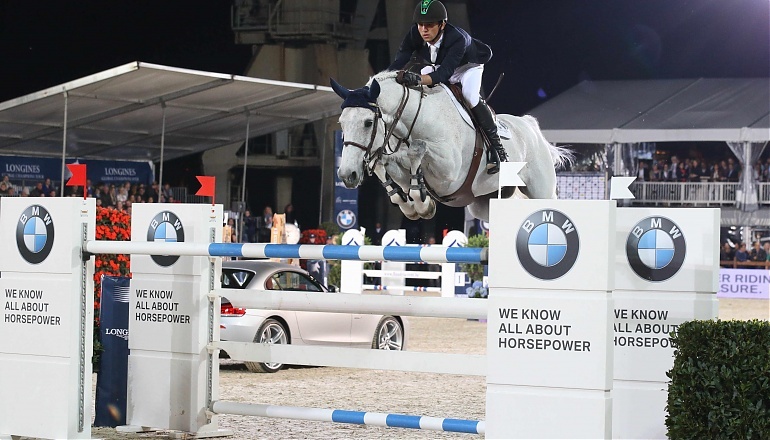 Home Equestrian News A beautiful new BMW for Zanotelli. A beautiful new BMW for Zanotelli. Marlon Zanotelli (BRA) gets to take home a brand new BMW after winning tonight’s feature class, the BMW Masters, riding Nenuphar Jac. The Brazilian fought off some big names to claim his gorgeous automobile prize in a close contest which took place before a packed VIP and Hospitality area. Ten horse and rider combinations were invited to take part in this special feature class of the day. The only rider to be eliminated for lowering a fence in the first round was Angelica Augustsson (SWE) and Feldrose. All nine remaining riders jumped clear in the second round, but round three saw the elimination of Olivier Philippaerts (BEL) and Eiken Sato (JPN). The fourth round saw World Number Two Ben Maher (GBR) eliminated and Nicola Philippaerts (BEL) fall by the wayside after his horse refused a large oxer. Gregory Wathelet (BEL) also lowered fence number one, putting him out of contention. Five riders went through to round five against the clock. First to go, Olympic Champion Steve Guerdat (SUI) had four faults, but put in a fast time. Marlon Zanotelli followed with a fast clear, putting what turned out to be too much pressure on the star riders to follow. 2014 World Cup Final winner Daniel Deusser (GER) cut in tight to the final line of fences and had an unfortunate refusal. Last to go, Edwina Tops-Alexander (AUS) took the same line to the last related distance as Daniel Deusser and had the first part down. Under the spotlights at the stunning dockside arena, thrilled winner Marlon, a huge smile on his face, took a spin in his sleek new BMW to warm applause from the audience. Tomorrow’s program of classes will be packed with even more excitement as the main event – the Longines Global Champions Tour of Antwerp Grand Prix gets underway at 6.30pm (local time). Watch this world-class, talent-packed class live and for free on GCT TV. Previous articlePénélope claims her second big win in Antwerp. Next articleGregory Wathelet wins ahead of this evening’s Grand Prix.